I have an obsession with Pantene hair. I try everything to achieve it. I blow dry, I flat iron, I use shine serums, I use deep conditioning treatments ... but nothing ever makes my hair look like it does in the Pantene commercials. 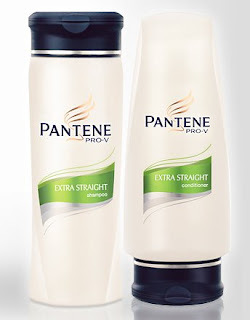 So -- here's a novel idea -- I decided to actually try the Pantene products that are supposed to give you super straight and shiny locks, the Pantene Pro-V Extra Straight Shampoo and Conditioner. And guess what? THEY WORKED. Ever since switching to these babies, my locks are so straight and shiny, I can't help but admire them every time I pass a mirror. (Okay, so maybe I find excuses to stand in front of one and admire them.) Each product is formulated with tons of vitamins to replenish moisture and really make hair gleam. I honestly have never received so many compliments on my tresses until I started using this shampoo and conditioner. It's truly unbelievable. I just know Pantene is going to come knocking for me to do their next commercial. I can feel it. Unfortunately, these products are no longer available. Ahhh thank uu i just picked this conditioner version up from Wal-Mart XD. I sitll haven't tried it. I always thought it was bull or something. But now I'm like inspired to go have a shower. (trust me that wasn't suppoesd to sound as bad as it does) XD. haha. I wonder if it's the same if you only have the conditioner? Meh who knwos :).